Ocean One Barbados is a luxury beach front condominium property located on Maxwell Beach which is a half mile stretch of pristine white sand beach with crystal clear blue water, on the south coast of Barbados. The location is perfect. It is only 10 minutes drive away from the Airport and the same distance from the main city/shopping centre Bridgetown. St. Lawrence Gap which is the popular street well known for its many dining, entertainment and partying options. It is also located only 5 minutes away from Oistins and the popular weekend fish fry and local entertainment. There are several activities available just a few minutes drive away. Golf, tennis, horse racing, surfing, polo and much more. Ocean one offers luxury in a peaceful and beautiful ocean front setting. With just under 1400 square feet of luxury floor space and exquisite furnishings, our 2 bedroom, 2 bathroom condominium is ideal for a small family or 2 couples looking to escape to a tropical haven. Both bedrooms feature an en-suite bathroom, there is a large modern Italian open plan kitchen, looking onto the living and dining. This room has floor to ceiling glass doors which gives you a view of the beach and sea from every angle. 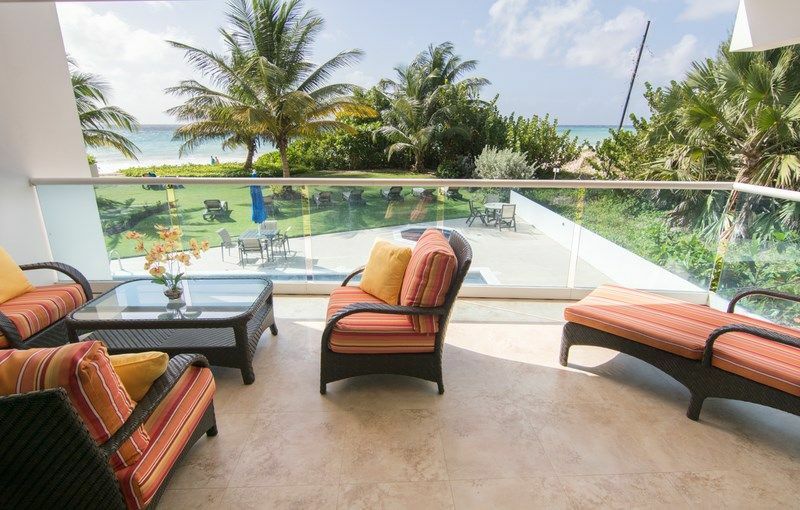 The generous balcony is ideal for lounging and enjoying the cool sea breeze. Other amenities include dishwasher, washer/dryer, air-conditioning, ceiling fans, telephone, flat screen cable TV, access to high speed internet and poolside cabana (additional cost). The property also features 24h security, gated, digitally secured entrance gate private driveway and parking. There is also elevator access, a contemporary lap pool, children’s plunge pool Jacuzzi and two gyms (one cardio and one weight room). Beautiful white sand beach perfect for swimming and all beach activities. The condominium has air conditioning throughout as well as in the lobby. Fully equipped with cutlery, crockery and linens. Communal Grill located on the 3rd floor. We had a terrific vacation here!! Everything was perfect with the condo inside and out. The beach access was great and the pool was nice to swim in as well. Never crowded. We will definitely go back. Remarkable condo location and price point! Perfect apartment for a small family. Rooms are big, each with ensuite, high end furniture and accessories. Modern kitchen appliances, beautiful patio overlooking ocean that is yards away. Very nice staff on property available to help in any way. Pool is well maintained. Great location, greatest white sand beach in Barbados. Property manager Janine and Barbara were a big help. Very easy to deal with, very friendly. Don't miss the Fish Fry in Oistens Friday night ! Will be be back next year! For many years Ocean One has been our preferred accommodation whenever we are visiting Barbados. We have already schedule our next visit and look forward to another great vacation. The units at Ocean One are superior in both location and comfort. Albert and his staff have provided excellent service and have helped us in all aspects of our visits from choice of car rental companies to general information of things to do while visiting Barbados. Albert is a hands on Manager and is available as needed with just a quick phone call. His staff is courteous and attentive. The units are always impeccably clean, security is excellent and the grounds are very well kept. The hotel next door has a great beach bar and restaurant that is only steps away along the beach. There is also a contemporary lap pool, children’s plunge pool Jacuzzi and two gyms (one cardio and one weight room). Payment can be made by Visa, Master Card or with a wire transfer. The deposit amount is NON-REFUNDABLE. If cancellation occurs within (30) days of the arrival date, the full amount is NON-REFUNDABLE unless the property is re-rented for that time.